During the course of Legion’s alpha test, there’ve been major changes and updates to report on. We’ve looked at the upcoming talent changes for Arcane, Fire, and Frost and the new artifact talent trees, too. Last time we discussed the completely new PVP honor talents. But aside from these major updates, the expansion also has a host of smaller changes, updates and patch notes that haven’t always fit into a column of their own. This week, we’re going to gather up all the updates from Legion that we may have missed, including graphical updates, changes to our Order Hall and glyphs. Fire was the first spec to receive spell graphics updates a few weeks back. All of Fire’s primary spells have been similarly updated from their previous casting animations. You can best get a sense of them from viewing this video, which includes side-by-side comparisons of each of the spells. Overall, the new animations take what was mostly an orange “glow” and give it some crackling substance, including small cinders that drift around the caster’s hands and fire that has some height before it’s cast. Fireball, Scorch and Pyroblast have all been updated similarly, including the actual fire effect on the target. The original spells now really fit in with the new spells, including Cinderstorm and Flame On. Combustion also gets a really impressive update, turning the caster into a molten version of themselves. The new Blast Wave has some new definition and overall looks much more like real fire. Flamestrike is the only new version I don’t like as much. I prefer the old version that has glowing flame in the cracks. The variant that includes Flame Patch is much better, lending a scorched earth effect in addition to the Flamestrike. Since Frost became available on the alpha we’ve been able to see its new spell effects as well. Ebonbolt looks deliciously icy, I was a bit concerned that it would take the “black ice” idea too far but it still looks blue and is a suitable upgrade for Frostbolt. Ray of Frost strikes me as a little lackluster still. Perhaps having some “splash” where it strikes the target might give it a bit more character. The rest of the updates are spells applied on your character itself, including Frozen Touch and a nice new look for Icy Veins with Chilled To The Core. We also get our first look at Ice Form. I think right now it’s a little too much almost like a ghost form? Needs a bit more blue and maybe some snowflakes. I don’t know if they’re still doing updates to the new animations though, so we might have to let it go. Another small change is the addition of some 3D elements to the Tier 19 sets. This is something Blizzard has talked about before with regard to things like quivers for Hunters and librams for Paladins and they’re adding some of these things to at least this tier of armor. You can see that there have been some additional scrolls added to the sides of the robes. The shoulder scrolls were already there. I actually like the side scrolls more than I do the shoulder ones, overall. It’s great to see this kind of small detail added to our armor sets, it really gives them some additional character. Three new glyphs have been added for Mages. Glyph of Smolder which says “You now smolder for a few seconds following a Combustion.” If you’ve seen the new animation for Combustion, this one makes more sense. The next is Glyph of Manic Size. Applying it means that your size is now tied to your mana pool. I don’t know if there’s going to be an upper limit on that, but it could lead to interesting results. The final addition is Glyph of Polymorphic Proportions, it has the mild effect of making your Polymorphs slightly larger. I could see this being useful especially if you’re using one of the tiny Polymorph forms, like Polymorph: Black Cat. 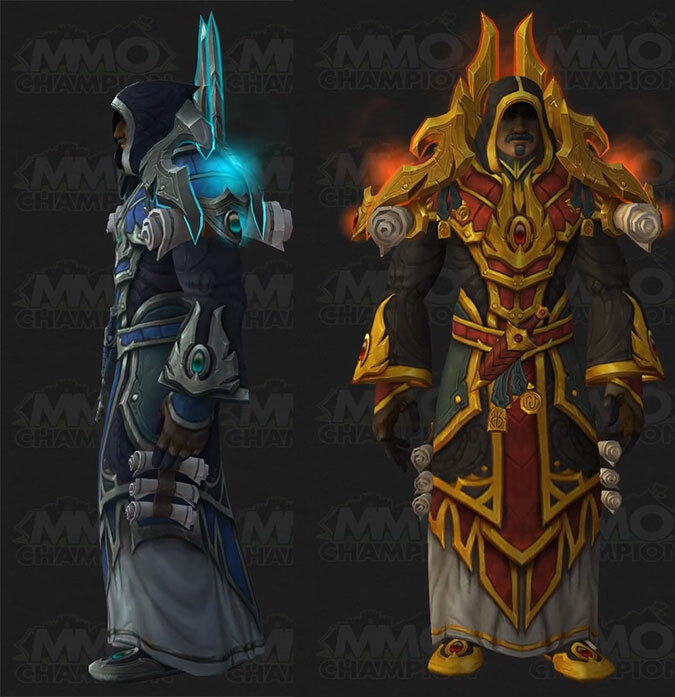 The last few alpha updates have seen many visuals and character added to our Order Hall. I love how it’s shaping up so far, although as you can see in the screenshots there are a few oddities/incomplete parts still, but on the whole they’ve added so many things to really make the hall feel Mage-ish in the extreme. One of my favorite parts so far is the library rotunda stretching up seemingly to infinity, and also all of the magical vegetation they’ve added to various places. I don’t know what it is, but why wouldn’t we add a bunch of weird magical plants just for the purpose of looking fancy? We’re mages, we can do that. There are too many additions to enumerate them all, but scroll through the gallery below if you’d like to see how things are looking! First of all, there’s currently a bug in the alpha that’s preventing Living Bomb from spreading appropriately when a target dies before its duration has expired. This will be fixed, though, and isn’t intended to behave that way. 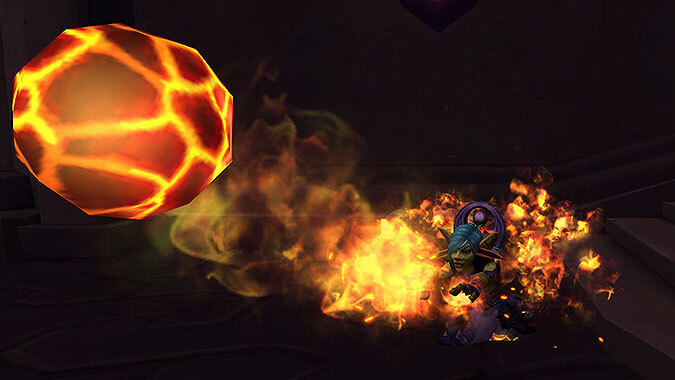 Some Mages have also expressed concern that removing Inferno Blast‘s ability to spread Living Bomb makes it feel too passive and overall slow. Twelve seconds is a pretty long spell duration to wait for it to spread “organically” even once the bug is fixed preventing it from spreading on a target’s death currently. This may be something that will be evaluated over the upcoming months of testing. Hey Frost Mages. One of the niches that Frost has excelled at for a while has been two-target damage, primarily due to Glyph of Splitting Ice. We want that to stay as one of Frost’s strengths. It didn’t make it in time for today’s build, but in next build, you’ll find Splitting Ice has returned as a talent, replacing Bitter Cold. The latest alpha build has delivered on the promise that Celestalon made regarding a replacement for Glyph of Splitting Ice. I’m glad to see that this was reconsidered, because two-target damage (or at least the option to have it) has been something available to Frost for long enough that it’s become something of a mainstay. Splitting Ice is now a talent that gets slotted in to replace Bitter Cold in the fourth tier of Frost’s talent tree alongside Ice Nova and Frozen Touch. This is going to mean that choosing to take Splitting Ice will require more sacrifice now than it ever did to have it as a glyph, and we’re losing out on two additional ways of generating Fingers of Frost charges by taking it, but at least the option will be there now to continue having cleave if an encounter warrants it. That’s all of the changes for this week, things have been fairly quiet in terms of Mage changes on the alpha but we should expect to see more now that all of the specs are in and balance and tuning continues.